For publication of a book on wine to be fully crowdfunded, you must know the subject is of unusual interest. 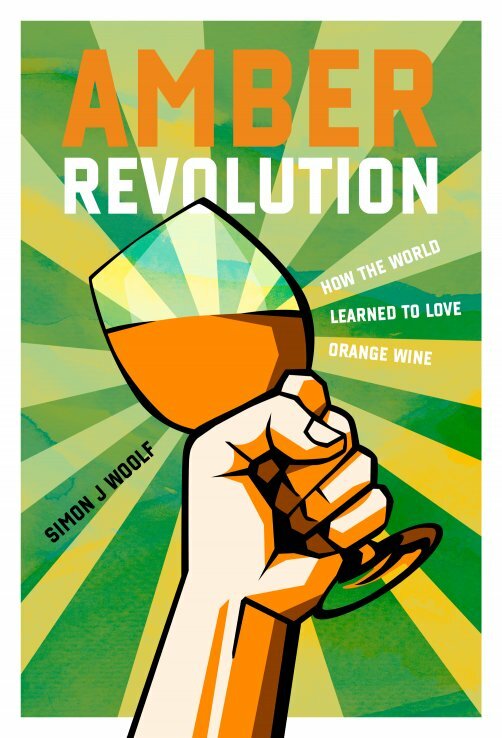 Nearly 400 people, myself included, find the subject of Orange, Amber or Skin-macerated whites and their history, of sufficient interest that our contributions have enabled Simon Woolf to produce this fascinating history and resurgence of the Amber Revolution. So memorable was this occasion, Woolf determined to write about it and this ancient wine style. But searches through his wine library and the internet turned up little information. ‘There was categorically no book,’ he concludes. His research led to awareness of Joško Gravner and Stanko Radikon in Oslavia but also to Georgia, where the ancient tradition of making wine in buried amphorae, known as qvevris, was still practised. Over the following three years, Woolf visited Georgia, Gravner and Radikon. Coincidentally, there was also renewed interest in orange wine, which had become fashionable. Surely the time was right for a comprehensive book on the history – ancient and modern – of orange wine. Amber Revolution with its truly revolutionary fist shake! ‘My fate was sealed,’ Woolf acknowledges. Giving up his IT job proved easier than finding a publisher; ‘None were persuadable,’ but no matter, a year ago Amber Revolution was crowdfunded on Kickstarter by orange winelovers worldwide. Woolf first tracks the political history of Friuli, Slovenia and Georgia, ‘ .. geographically volatile parts of the world’ for their 20th century populations. Apart from loss of identity, their history was buried. No wonder the story of orange wine was sketchy to say the least. Chapters on each of these regions, their grape varieties, winemaking both ancient and new-wave and the making of qvevris are covered; evocative photographs of the winemakers (who look very much people of the soil; their cellars are likewise humble – no fancy modern constructions here!) and their winemaking traditions (the photographic sequence of Joško Gravner punching down ribolla gialla grapes in qvevris is particularly illustrative) complement Woolf’s flowing story. As with anything out of the ordinary in a modern wine world, where a few classic French varieties hold sway, orange wines from little known varieties and regions have been a strange anomaly. Thanks to their red-wine like texture, including tannins, they are much better appreciated with food. Chapter 9, I am kurious oranj tracks some of America’s top sommeliers’ early experiences with and efforts to get orange wines onto wine lists and into customers’ glasses. Needless to say, it required much effort. Many have still not come to terms with orange wine which is seen as being allied to the natural wine scene, as the Haters gonna hate chapter spells out. Hugh Johnson famously dismissed orange wines as ‘.. a sideshow and a waste of time’. A tasting with Woolf revealed Johnson didn’t have a clear idea of what orange wine is, rather had conflated it with natural wine. That he left with a better appreciation of skin-fermented whites shows there are many misconceptions and much education needed. The final section concentrates on Woolf’s recommended producers worldwide, including contact details and some opinions. Craig Hawkins of Testalonga; Intellego’s Jurgen Gouws, who caught Hawkins’ enthusiasm when working with him at Lammershoek and Mick and Jeanine Craven of Craven Wines, who transformed clairette blanche from its Cinderella status via skin contact, represent South Africa. When Woolf comes to update Amber Revolution, I dare say he’ll have a much larger choice of South African producers to consider. Two that come to mind are Richard Hilton with his new truly orange, The Ancient Viognier and the ever-innovative Charles Back, who has experimented with skin-fermented grenache blanc (and noir), still lying in small French oak barrels. New qvevris are en route. With winemakers’ technical expertise increasing, the wines are improving and getting more interesting. It is to be hoped the Wine and Spirit Board keeps pace with this movement. When I decided to be part of crowdfunding Amber Revolution, beyond my enthusiasm for these wines, I had no idea how the book would turn out. I’m delighted I’ve helped in a small way in its realisation. Woolf’s writing is a pleasure to read, informative but also with personal touches. Throughout the chapters there are separate inserts on such issues as Challenges and faults in orange wines; Serving and food matching, The art of making qvevri and much more. ‘There was categorically no book,’ Woolf concluded seven years ago. Today thanks to him, there is. Whatever your opinions on orange wine, Amber Revolution will surely fill in many gaps in winelovers’ knowledge; it also does justice to the pioneering regions of Friuli, Slovenia and Georgia. Amber Revolution may be ordered from Simon Woolf’s website http://www.themorningclaret.com/shop/ for 35 Euros. Not forgotten, but there’s also Mullineux, Francois Haasbroek, Bosman, Springfontein, probably Avondale & maybe others. Time for a comprehensive orange wine tasting, me thinks! And Smiley White, not to mention that there is still some Skinny Legs wines around, etc.A tasting of these would be very interesting indeed! I also think Platter’s should list the category separately in their summarised ratings listing at the back of the guide, like they do some other styles, such as the port-style wines. They are listed separately in Platter, under Skin-Macerated whites, but I see Ryan submits only his Terracura Syrah, not the smileys. The producers are supposed to tick off that box on their submission forms, but I think the whole wine has to be on skins to qualify &, Francois Haasbroek’s Blanc for instance has only a portion skin-fermented. As the category is growing, I’ll try to get this sorted with Phil (Platter ed) before next year. Oh, I didn’t even know that – thanks! Incidentally, Smiley is of course also only partially a skin contact wine. Most grateful, Kwisp, that you’re helping me compile a list of these skin-fermented whites. Rooi Groen (Semillon) from J.C. Wickens Wines. He also has a new skin contact chenin. The new Smiley Spesiale is also a skin contact Chenin. From Jurgen’s Intellego, at least the Elementis and what about arguably the doyen of all SA skin contact wines, the Testalonga El Bandito? I’m sure there are quite a few more – I’ll revert back if any comes to mind. Thanks Udo. I’ve set up a tasting of skin-macerated whites; if all are delivered on time, we’ll have just over 30! Tasting next Wednesday, 24th, a report to follow on this site.